You need to get calories from somewhere, should it be from carbohydrate or fat? Just a brief note on metformin. No need for detailed analysis as there's not much to argue with. I think they are correct, even if we have differing views of the function of the glycerophosphate shuttle. The paper makes a pretty good case for the action of metformin, at pharmacologically appropriate concentrations, as being to inhibit mtG3Pdh. At higher concentrations it undoubtedly inhibits complex I but its action at the glycerophosphate shuttle makes a great deal more sense. In the last post I looked at the inhibition of this shuttle as an inhibitor of glucose signalling which could be rescued by adequate fatty acid oxidation in the peripheral tissues. This too would undoubtedly be a critical action and I'll come back to it later. Other parts of the paper were good too and I particularly enjoyed the forced change in lactate:pyruvate ratio in the culture medium section which mimicked metformin's action, but I think that's enough on modern views of metformin acting on the liver. I accept it works through inhibiting mtG3Pdh and subsequent change in redox status. Next proper post will be some ancient history from 9 years ago looking at muscles and metformin, where the Protons ideas from the last post get some support. 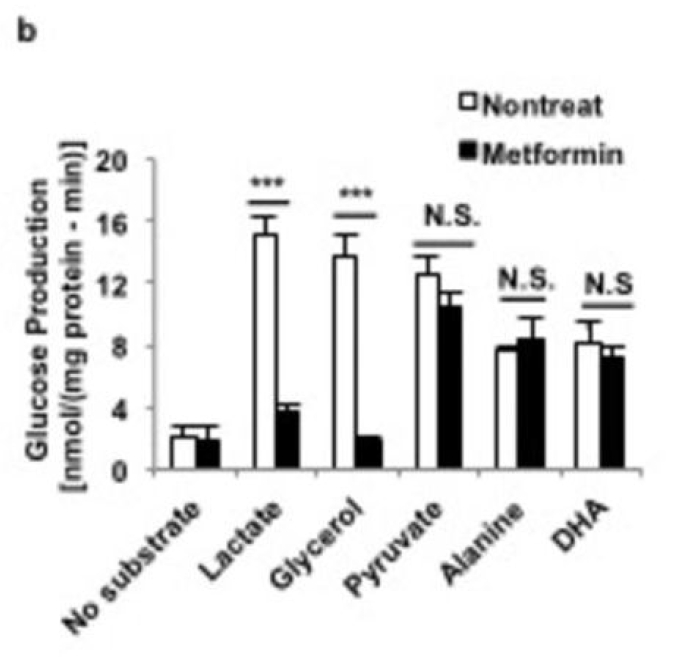 Summary: Metformin suppresses hepatic glucose output through decreased gluconeogenesis by inhibiting mtG3Pdh. Lots of evidence. If we look at a mouse with a deletion of the gene for cytoplasmicG3Pdh we have a reasonable model for elimination of the glycerophosphate shuttle at the level were glycolysis would normally be used to drive reverse electron flow through complex I, to facilitate insulin signalling. These mice are remarkably normal and can swim in deep water, possibly not too happily, for at least 20 minutes with weights on their tails, i.e. they can exercise, at least if necessary to save their lives. 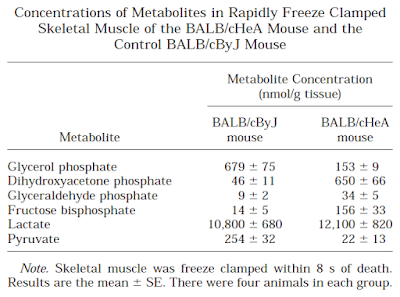 They have markedly reduced levels of pyruvate and mildly elevated levels of lactate in muscle tissue compared to control mice. In a cell [H+] is a constant and K is also a constant (by definition). So clearly we have a lot more NADH available in the knockout mouse, so more lactate gets formed from pyruvate, which becomes a minor player in the cascade of glycolysis to oxidative phosphorylation allowing lactate to take over. 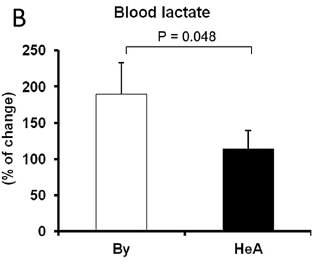 The authors of the mouse paper suggest that the lactate is expelled from the cells and that the Cori cycle, in the liver, is active to deal with the it. I’d prefer to think of lactate as being shunted directly to the mitochondria for use in the TCA. If you subscribe to the view that the glycerophosphate shuttle is needed to provide NAD+ for glycolysis to proceed you might expect a few problems with glucose processing. There is undoubtedly an accumulation of metabolites upstream of the glycerophosphate shuttle and a depletion of those downstream but glycolysis does proceed. But from my point of view, with no glycerophosphate shuttle, there is nothing to allow the body to facilitate insulin’s drive to self activate using glucose. How do these mice cope? HeA are the knockout mice, By are the control mice. 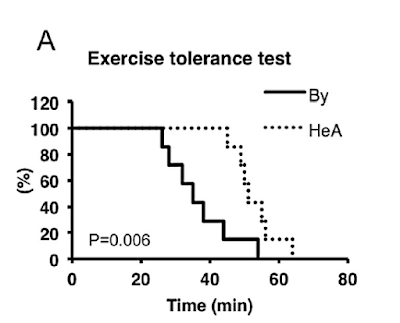 Knockout mice run harder and for longer than control mice. The rest of the graphs use the same coding, solid line is the control mice, dotted line the knockouts. Pretty much as well as the control mice. 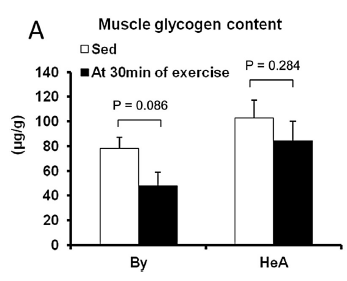 These modified mice, which cannot use glycolysis to trigger insulin signalling, have a tendency to have MORE glycogen in their muscles (although p is greater than 0.05) at rest and they deplete it less under sustained near-maximal exercise. I'd guess insulin does signal. So what might be going on in these knockout mice? The requirement for insulin signalling is a modest amount of reverse flow of electrons through complex I, ie the CoQ couple must be reduced. The usual, here absent, technique is the glycerophosphate shuttle. But we can reduce the CoQ couple in other ways. My favourite way is via the oxidation of the FADH2 generated by metabolism of saturated fatty acids. How much FADH2 is needed to replace the glycerophosphate shuttle? From the graph of lipid oxidation above we can see that knockout mice under exercise are oxidising somewhere around 45mg/kg/min of fat. 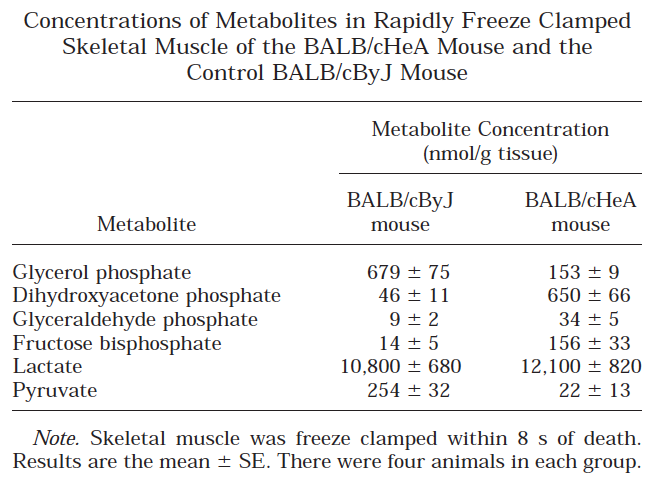 The control mice are oxidising just over 30mg/kg/min. 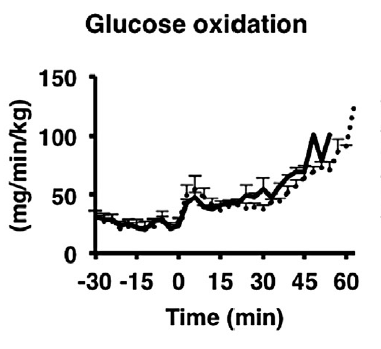 From the Protons perspective the increased fat oxidation is a requirement for normal insulin signalling and this insulin signal cannot limit fatty acid oxidation until the rate is almost 50% higher in the knockout mice than in those where the glycerophosphate shuttle works. 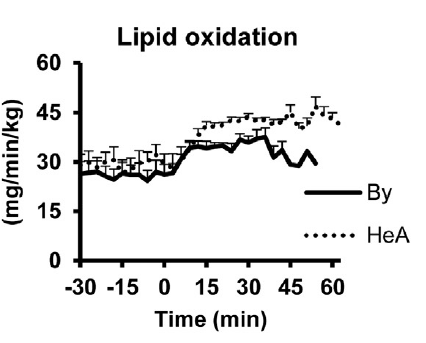 These mice oxidise fat because insulin signalling is not being triggered by glycolysis. It also means that lipid oxidation has to be higher before it can trigger insulin resistance and cellular energy influx limitation. We don't (as far as I know) have a drug to inhibit cytG3Pdh. We do have one to inhibit mtG3Pdh, the other half of the glycerophosphate shuttle. It's called metformin. Does metformin do the same thing as having a cytG3Pdh knockout does? Under exercise? In terms of getting the King Of the Mountains jersey in the Tour de France perhaps? Aside. I think I might start sticking the refs from a post in at the end. There are times I can't remember in which post a paper was used, searching my own blog/hard drive might be easier if the author or a keyword are actually present rather than there just being a highlighted text field!!! 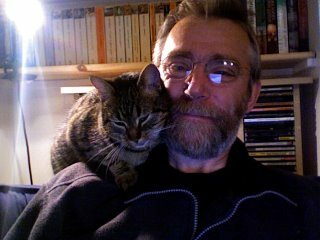 The blog is getting a bit unwieldy. Metformin improves performance in high-intensity exercise, but not anaerobic capacity in healthy male subjects. I am Petro Dobromylskyj, always known as Peter. I'm a vet, trained at the RVC, London University. I was fortunate enough to intercalate a BSc degree in physiology in to my veterinary degree. I was even more fortunate to study under Patrick Wall at UCH, who set me on course to become a veterinary anaesthetist, mostly working on acute pain control. That led to the Certificate then Diploma in Veterinary Anaesthesia and enough publications to allow me to enter the European College of Veterinary Anaesthesia and Analgesia as a de facto founding member. Anaesthesia teaches you a lot. Basic science is combined with the occasional need to act rapidly. Wrong decisions can reward you with catastrophe in seconds. Thinking is mandatory. I stumbled on to nutrition completely by accident. Once you have been taught to think, it's hard to stop. I think about lots of things. These are some of them. Organisation (or lack of it)! The "labels" function on this blog has been used to function as an index and I've tended to group similar subjects together by using labels starting with identical text. If they're numbered within a similar label, start with (1). The archive is predominantly to show the posts I've put up in the last month, if people want to keep track of recent goings on. I might change it to the previous week if I ever get to time to put up enough posts in a week to justify it. That seems to be the best I can do within the limits of this blogging software!